HIV or AIDS-associated malignancies present treatment challenges for physicians and a serious public health problem in nations with a high incidence of HIV/AIDS. Many low and middle income countries, such as in Sub-Saharan Africa, suffer disproportionally from the HIV epidemic and experience very high numbers of AIDS defining cancers. Kaposi’s sarcoma, non-Hodgkin’s lymphoma (including primary central nervous system lymphoma), and cervical carcinoma are all more prevalent in individuals with HIV/AIDS. Even today they account for the majority of cancers in HIV positive persons seen at UNC and they are the leading cancers in men and women in many countries globally. It is estimated that there are over one million people living with HIV/AIDS in the United States today, but that number is dwarfed by the over 33 million people worldwide who have the disease. With the advent of Highly-Active Antiretroviral Therapy (HAART), HIV-infected individuals are living longer and are therefore at a higher risk for developing AIDS-related malignancies. Cancers in the context of HIV infection tend to be more aggressive and resist treatment with standard therapies. Since 2008, UNC Lineberger, in conjunction with the UNC Center for AIDS Research, has received funding from NCI/NIH to promote basic and translational pilot research projects on HIV-associated malignancies. 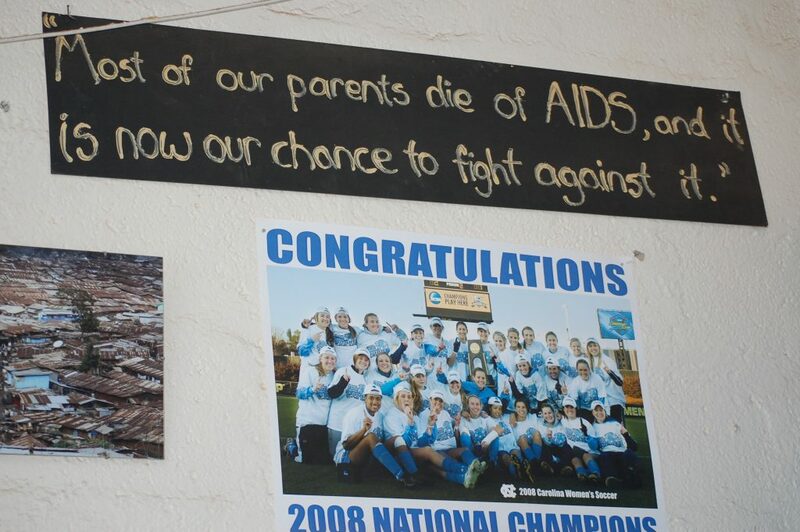 View the UNC Center for AIDS Research Newsletter. Collaboration in the U.S., Malawi, China and Brazil to accelerate our understanding of the basic mechanisms underlying AIDS-associated cancers and the best treatments for these malignancies. In the U.S., UNC-Chapel Hill is a clinical site for the NCI-sponsored AIDS-associated malignancy consortium (AMC), which conducts clinical trials that enroll HIV-positive individuals with cancer. In Malawi, nearly 50% of the population is HIV-positive and 30-40% of the HIV positive population die of Kaposi’s sarcoma. Drs. Dittmer and Hoisseinipour are collaborating with several UNC-Chapel Hill investigators on cancer clinical trials in Malawi. UNC Malawi is now also an enrolling site for the AIDS malignancies consortium. In China, there is a UNC Infectious Disease-initiated HIV surveillance project in Xinjiang and Guangxi Provinces which records all incidences of cancer in the HIV-positive population. In India, Drs. Dittmer and Damania collaborate with clinicians and faculty at the TATA memorial hospital on clinical trials for lymphoma and Head and Neck cancer in persons living with HIV/AIDS. The UNC Center for AIDS Research (CFAR) is located in the UNC Lineberger building. This allows for cross-disciplinary research collaborations. There are resources offered by both UNC CFAR and UNC Lineberger Comprehensive Cancer Center that facilitate global cancer research at UNC. Membership in cooperative clinical trials groups that focus on diseases in HIV-infected individuals. Dr. Dittmer is director of core laboratories for the AIDS Malignancy Clinical Trials consortium (AMC), and chairs clinical trials in Kaposi sarcoma. Drs. Dittmer and Stevn Park are co-PIs for the AMC site at UNC-Chapel Hill. Drs. Damania, Joe Eron are members of the ACTG (AIDS clinical trials group). The UNC Health Registry, a survivorship cohort of 10,000 patients, is in the process of being established and will include HIV-positive individuals with cancer.